SLINGO gives a free welcome offer. Add your card at Slingo for 5 FREE GAMES worth £1 each on Slingo Fortunes, Slingo Extreme and Slingo Riches – no deposit required! First Deposit Offer - 100% up to £100! Start your Slingo experience the right way - with a 100% deposit bonus up to £100! That means: deposit £10, play with £20. It doesn’t get better than this. This applies to new customers only. Second Deposit Offer - 20 Bonus Spins! Things just got even better. Make your second deposit of £10+ and get 20 bonus spins right away to use on all these fan favourites: Gonzo’s Quest, Twin Spin, Jack & the Beanstalk and Starburst. They’re waiting! This promotion is available to new customers who signed up while this offer was live, registering a validated account with Slingo.com. This offer is valid for 30 days. Your 5 free games are available to play on Slingo Fortunes™, Slingo Riches™ and Slingo Extreme™. You must play your 5 free games within 7 days of them being awarded otherwise they will be forfeited and no winnings from your free games will be credited to your account. You must play all your 5 free games before any winnings are credited to your account. Any winnings from your 5 free games will be credited to your account as bonus funds. Any bonus funds awarded because of your free games must be spent within 7 days otherwise they will be forfeited. 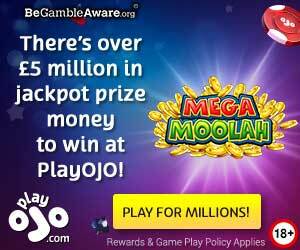 The maximum accumulated win using bonus funds awarded from your 5 free games is £100. If the win is more than £100, then upon the 60x wagering requirements being met £100 will be transferred to your cash balance and the remainder will become void. General Slingo terms and conditions apply.